Wicker’s Black Label Steak Marinade is an Asian-inspired sauce featuring a soy sauce base and tangy Asian spices. 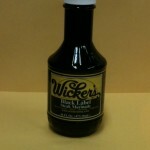 If you like Teriyaki style sauces or Soy Sauce, you will love Wicker’s Black Label Steak Marinade. Hand-crafted in Hornersville, Missouri, USA, Wicker’s Black Label Steak Marinade adds a mouth-watering flavor you’ll recommend to friends. Great for rice, vegetables, and stir-fry too!